FB2 or Fictionbook file is an open XML based eBook file and has the “.fb2” extension. This format was primarily designed for fictional literature and supports various OS platforms like Pocket PC, Windows, UNIX systems and eBook reading devices. PDF file format is more popular and recognized amongst users and is also easy to access and share without any loss of content. 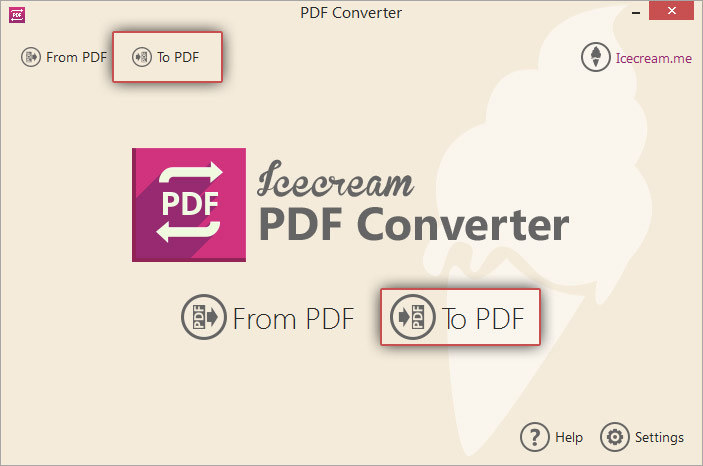 If you wish to convert FB2 to PDF format, opt for Icecream PDF Converter. This software is easy to use and is designed to convert files from various formats including FB2 to PDF and from PDF to others as well. Follow the steps you see right below to convert files from FB2 to PDF format. To start the whole process you need to first download Icecream PDF Converter. Follow the step by step instructions in the setup wizard of the program to complete the installation of the software on your PC. 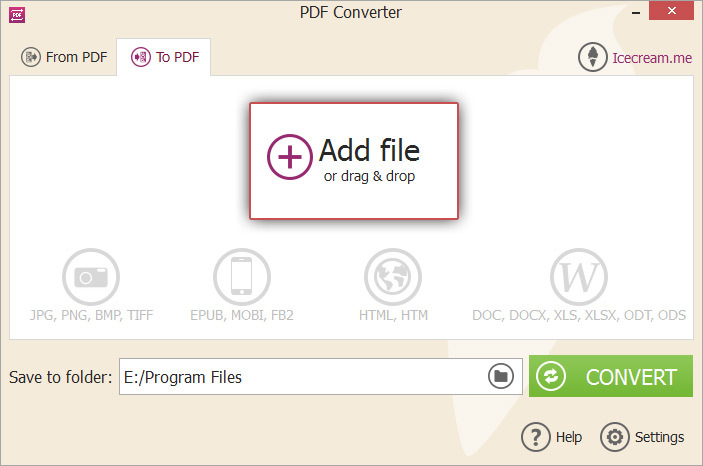 You can now start using the application and continue straight to FB2 to PDF conversion. On the opened window the installed application you can see 2 possible modes of work with it: “From PDF” and “To PDF”, select the second one to proceed. Click on the “Add File” button to open Windows Explorer to browse and add FB2 files from your PC. You can also drag and drop your FB2 files to this window. All the selected files will be visible in a table. You can remove some files using the delete icon beside each file or turn to “Clear all” button in the bottom of the window to remove all the listed files at once. Use the UP and DOWN arrow buttons in the right hand side of the window or drag and drop mechanism to reorder the individual file sequence. Check the “Merge all into one PDF file” option to combine the contents of all the FB2 files added to a single PDF. You can specify optional conversion settings by clicking the settings icon beside the file in the listbox. To use the same settings for all the files, use the settings icon in the bottom of the window. Settings panel offers the following settings: Filename (the created PDF will be saved with this filename); Title (tile of the new PDF document); Publisher (the publisher information to be used in the PDF); Password (password to open the PDF file). Press the “SAVE FILE SETTINGS” button to save these settings. Press “CLOSE” to exit from the settings panel without saving. 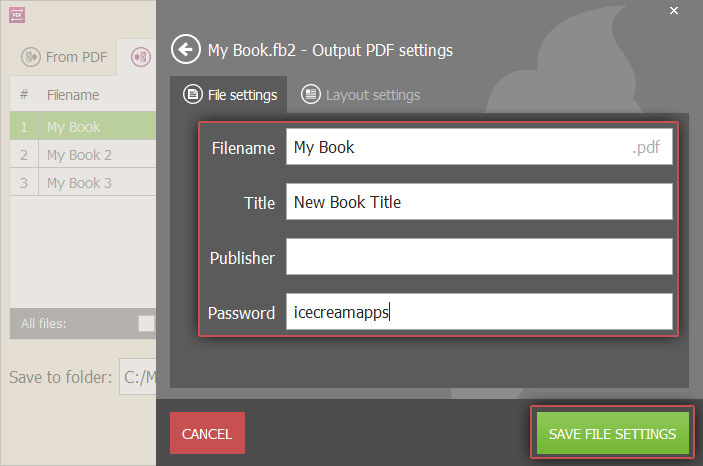 Click on the folder icon in the “Save to Folder” field in the very bottom of Icecream PDF Converter window to browse and select a destination folder of your choice. All the converter to PDF files will be placed in this folder. You can select a different folder at any time before triggering the conversion process. Make sure you have selected and added all the required files, placed them in the right order and tweaked all the settings in the needed way. Click on the “CONVERT” button to trigger your FB2 to PDF conversion . You will right away see the program's progress bar with some additional information like the elapsed time of the currently running process and the file being converted. After all your FB2 files have been successfully converted to PDF, a confirmation message will be displayed. Click on the OPEN FOLDER link in this message to open the target folder and view the PDF files.